There’s a South American proverb that “A good broth will resurrect the dead.” While that may not be literally the case, bone broth is one of the best things to give someone who is sick or recovering, since it helps boost the immune system to fight sickness, is rich in minerals, and has the building blocks needed for our body to repair its own gut lining (and 80% of the immune system is in the gut). 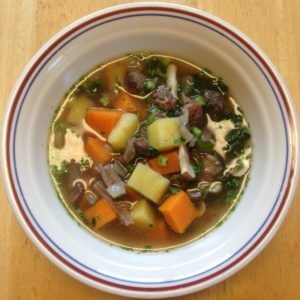 I recently made this soup for a family friend who was recovering from surgery. 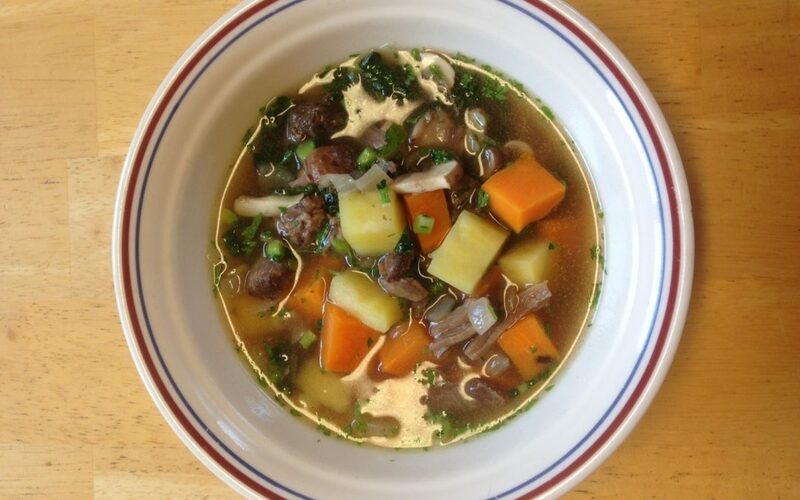 When I was asked to make a meal for her, the first thing that popped into my head was a soup with a gut-healing, mineral-rich bone broth as the base. The meat is soft and falls apart in your fingers, so it is easier to digest, which is important for a recovering person who has been under stress (which depletes stomach acid, therefore lowering digestive function). I added a bunch of other veggies to give it a good punch of extra vitamins and minerals, too. Doesn’t this look way more delicious than just taking a multi-vitamin? My secret ingredient with beef broth soups is fish sauce. It sounds weird, but it provides the umami (savory) taste that rounds out the soup and gives it a little extra something! The mushrooms add umami, too. A hearty soup made with gut healing bone broth and mineral-rich vegetables to help the sick and recovering get well again. Make the bone broth ahead of time by simmering the bones in water for 12-72 hours with ¼ cup of apple cider vinegar. Strain broth, let it cool in the fridge. Pick apart the meat from the bones and set aside the meat in another container. The next morning, remove the fat from the top of the bone broth. Sauté the onions in a large soup pot in a solid cooking fat until golden brown. Add the broth, bay leaves, and sweet potatoes. Cook over medium heat until potatoes are soft but not mushy, about 15 minutes. Add the meat, chopped kale stalks and leaves, garlic, mushrooms, and fish sauce. Cook for another 5 minutes until all the veggies are tender.